The expansive resort combines 13 acres of sunny lawns and shaded palms. Whether on the putting green or shuffleboard court, someone's gonna want a rematch. 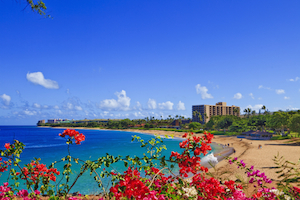 Gaze off into the ocean, soak in the sun, or snorkel along the offshore reef. Lounge in the sun, hop in for a dip, or cook out on the poolside grills. With a playground, picnic area, and gentle surf, Honokowai Beach Park is great for kids. Kids will love putt-putt golf and other fun lawn games. The resort is lined with natural ponds, palm trees, and spacious lawns. Aston at Papakea Resort is located on thirteen acres of beautiful grounds with palm trees and natural ponds on the Kaanapali Coast of Maui. There is no shortage of family games and activities available at Aston, from a twelve-hole putting green to shuffleboard and lighted tennis courts. The resort offers two pools with hot tubs that don’t get too loud, making them a nice place to lounge in the sun. Though the sand on the beach is limited, you can always hop in and snorkel in the reef, or take the short walk to nearby Honokowai Beach Park. For a delicious family meal, take advantage of the bbq grills for a cookout or head to the Beach Club Restaurant Bar & Grill, next door at Aston Kaanapali Shores. Show them your room key, and they’ll give you ten percent off your lunch or dinner. Individually decorated studio and one- to three-bedroom condos sleep two to eight guests and sport beautiful ocean, oceanfront or garden views and come with all of the amenities of home. Family field trips to Times Supermarket and Fish Market Maui are definitely a must; your full kitchen is just waiting to be stocked with everyone’s favorites. When it comes to in-suite entertainment, Aston at Papakea has you covered. Flat screen TVs have premium cable, and you’ll also have a PlayStation 3! Pack favorite movies and games from home to enjoy during your vacation. Do a little multitasking and throw a load of laundry into your in-suite washer/dryer while the family enjoys a movie or a plays a game. Don’t worry about spending your trip dusting or vacuuming; the resort has daily housekeeping. Practice your million-dollar swing at Royal Kaanapali Golf Course, just a short drive from the resort. The course was designed by Robert Trent Jones Senior and opened in 1962. This eighteen-hole course is known for hosting several golf legends such as Arnold Palmer, Nancy Lopez, and Billy Casper. Up for some retail therapy? Whalers Village is the place for you! Treat yourself to a new handbag from Kate Spade or Louis Vuitton. Looking for a new piece of jewelry? There’s Pandora, Maui Divers or Alex and Ani. If you’re looking for apparel, visit Lululemon, Tommy Bahama or Quicksilver. Check out the selection of shades at Sunglass Hut. Hungry? Grab a slice at Nikki’s Pizza, check out Leilani’s on the Beach, or Joey’s Kitchen. Surprise the little ones with dessert from Häagen-Dazs or Yogurtland.